We do indeed have some great low carb recipes in this week’s roundup of the most popular on our Low Carb Facebook page! There is more than enough to make a delicious meal here and it appears y’all are not especially into the treats this week so much–we just have the one–but are hankering for some extra-easy as well as healthy dinners and sides. 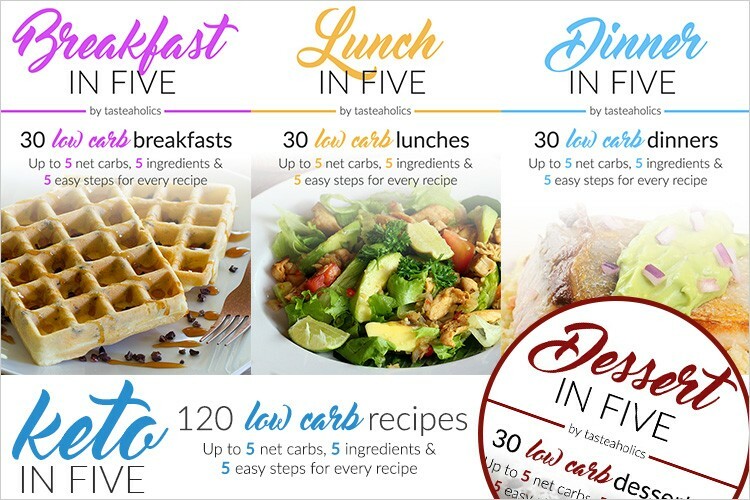 So here you go: Great low carb recipies that millions of low carbers world round are saving, sharing, clicking, pinning and of course, cooking! Listed in order of popularity. Peanut Butter Balls These super-easy 4-Ingredient Peanut Butter Balls would be SO cute made up as mini peanut butter cups, using something like these Mini Muffin Silicone Liners. I would probably also use Swerve as my sweetener, but I use Swerve for most sweetening. Stevia is a great option, too. Just be vary careful not to put too much in, as it can become bitter if you do. Roasted Cabbage Wedges A little Olive oil, a few seasonings and a lined pan, and you have Oven Roasted ‪‎Cabbage‬ Wedges! Betcha they would be especially good with some Flavored Olive Oil. Chicken, Avocado & Bacon Salad Chicken, Avocado and Bacon Salad looks scrumptious! And I love that the dressing recipe has Apple Cider Vinegar–not only for flavor but because it’s so good for you. Cheeseburger Casserole Cheeseburger Casserole doesn’t have any odd ingredients. It’s cheeseburger ingredients, popped into casserole dish. No bun required! Chicken Florentine Casserole ‬ Chicken Florentine Casserole could not be easier! Another “just need a dish” and a few simple ingredients recipe and you’re good to go! Chicken Fajita Stuffed Peppers Chicken Fajita Stuffed Peppers are one of those “why didn’t I think of that?” combos. She uses a fusion_builder_column]muffin tin here to keep them from tipping over. Brilliant! Zesty Chicken Bites Low Carb‬ Zesty Chicken Bites can be breaded with either Almond Flour or Flax Meal. Spices like easyazon_link asin=”B0019I2FP0″ locale=”US” new_window=”default” nofollow=”default” tag=”lczweb-20″ add_to_cart=”default” cloaking=”default” localization=”default” popups=”default”]Cayenne Pepper, chili powder and Red Pepper Flakes put the “zest” in Zesty! Mmmm. Southwest Chicken Salad Southwest Chicken Salad can make deliciousness from chicken leftovers, or you can use up any canned chicken you bought and later wondered, “Why?” Another one that calls for Diced Tomato & Green Chilies known around here as Rotel. You can also just combine your own tomatoes and green chilies instead. Chicken & Zucchini Poppers These Chicken and Zucchini Poppers look like a whole lot of delicious! I’ll bet they would be especially good fried up in ghee, one of the suggestions on the recipe. Add a cute serving dish and you’re set for company. Have you tried any of these great low carb recipes? What’s your verdict?